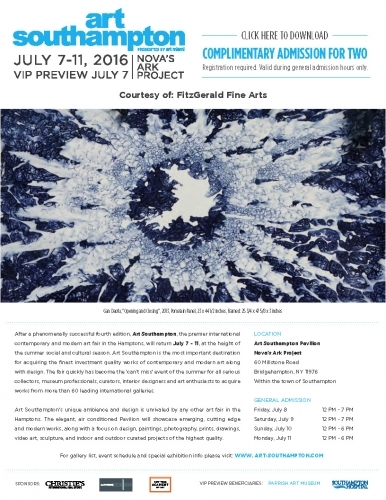 After a phenomenally successful fourth edition, Art Southampton, the premier international contemporary and modern art fair in the Hamptons, will return July 7 – 11, at the height of the summer social and cultural season. Art Southampton is the most important destination for acquiring the finest investment quality works of contemporary and modern art along with design. The fair quickly has become the ‘can’t miss’ event of the summer for all serious collectors, museum professionals, curators, interior designers and art enthusiasts to acquire works from more than 60 leading international galleries.